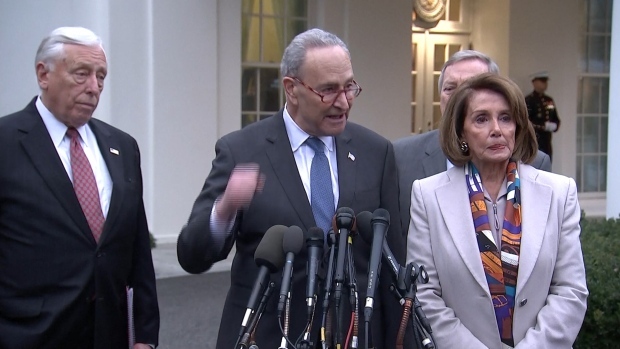 On their first day in the majority, House Democrats on Thursday night passed a plan to re-open the government without funding President Donald Trump's promised border wall. 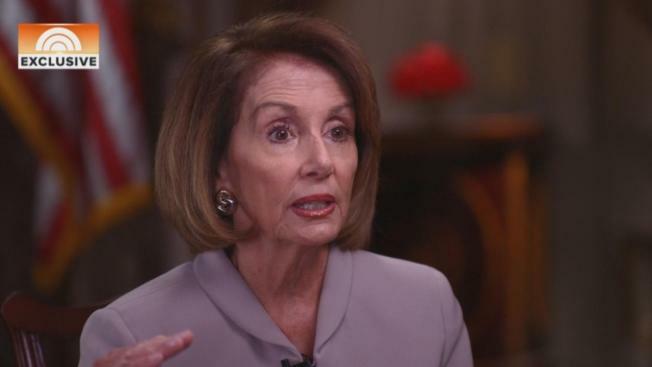 House Speaker Nancy Pelosi said Trump and Senate Republicans should "take yes for an answer" and approve the border bill, which was virtually identical to a plan the Senate adopted on a voice vote last month. "We're not doing a wall. Does anyone have any doubt that we're not doing a wall?" Pelosi told reporters at a news conference Thursday night. Pelosi, who was elected speaker earlier Thursday, also took a shot a Trump, calling his proposal "a wall between reality and his constituents." Trump strode into the White House briefing room Thursday — the 13th day of the partial government shutdown —and declared that "without a wall you cannot have border security." He then left without taking questions from reporters. The appearance came hours after the new Congress convened, with Democrats taking majority control of the House and returning Pelosi to the speakership after eight years of GOP control. The Democratic legislation to re-open the government without funding the wall is going nowhere in the Senate, where Republicans want Trump's endorsement before voting on a funding package. Trump said his meeting with the union officials had long been planned and just happened to come at "a very opportune time." He also claimed his refusal to budge was winning praise, telling reporters, "I have never had so much support as I have in the last week over my stance for border security." White House and Department of Homeland Security officials have spent recent days trying to make a public and private case that the situation at the border has reached a "crisis" situation that demands more money than Democrats have offered. The Democratic package to end the shutdown includes a bill to temporarily fund the Department of Homeland Security at current levels — with $1.3 billion for border security, far less than Trump has said he wants— through Feb. 8 as bipartisan talks would continue. It was approved, 239-192. Democrats also approved a separate measure to fund the departments of Agriculture, Interior, Housing and Urban Development and others closed by the partial shutdown. The bill, which would provide money through the end of the fiscal year Sept. 30, was approved, 241-190. "Why not fully fund the Department of Homeland Security? Why doesn't the Pelosi bill do that?" said White House counselor Kellyanne Conway. Senate Democratic Leader Chuck Schumer urged Majority Leader Mitch McConnell to put the House Democratic package on the Senate floor and send it to the president, saying it would show Trump "the sweet light of reason." McConnell has dismissed the idea as a "total nonstarter" and a waste of time. But some Republican senators appeared open to at least part of the Democrats' proposal. "I'm not saying their whole plan is a valid plan, but I see no reason why the bills that are ready to go and on which we've achieved an agreement should be held hostage to this debate over border security," said Sen. Susan Collins, R-Maine. "Congress needs to take further action on border security, but that work should be done when the government is fully open," added Sen. Cory Gardner, R-Colo.
Vice President Mike Pence, who was on the Hill Thursday to swear in new senators, took a hard line, telling Fox News Channel's Tucker Carlson, "Bottom line, if there's no wall, there's no deal."